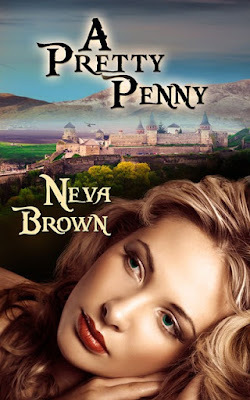 Neva Brown is here this week for Thursday Threads to share an excerpt from, A Pretty Penny. Take a look! How they navigate through government agents' plans, vindictive women's plans, and their vastly different upbringing to find common ground to nurture a love that clings through all the troubles and trials takes the reader on a compelling vicarious journey. "I presume you're Wilma's little friend." His emphasis on "little" implied so much more than the fact that she was only five foot two, one hundred five pounds. She stiffened. "I'm Penelope Ann Jones. And, yes, Wilma and I are friends." "I'm Clayton Brandt, your boss." His icy stare chilled her from head to toe. "Are you another of her projects, or can you do a day's work for a day's pay?" Her haughtiness probably added to his irritation, but she wasn't about to cower before this arrogant tyrant. "I can do the work Wilma said would be expected of me, sir." She bit her tongue to keep from adding that she had a master's degree in finance, held a CPA license, and had worked as a secretary all the way through college. Just because she had been following the rodeo did not make her incapable, just besotted with love. He curtly dismissed her. "Get buckled up. The pilot is ready to take off." "I thought we got through your ‘mother hen' phase a few years back. Where did you find this one?" Wilma's longsuffering look made Penny strain to hear the reply. "The ‘mother hen' periods as you call them passed a long time ago. Penny is different. She was Jason's wife, but none of our family even knew they were married. They'd been married almost a year when that bull killed him." "Then she's a rich young widow. Why does she need to work?" "Things aren't quite what they seem. Jason never got around to changing his will and never had her sign a signature card to draw on his account at the bank. Being his usual distracted self, he just gave her cash. She had money but no permanent financial security." "So I guess you're paying her bills. No wonder you want to put her to work." "Clayton, she was my baby brother's wife and was ‘holed up' in that fifth wheel at a trailer park with nothing but crackers and peanut butter. She's smart and willing to work. You know I wouldn't ask you to hire her if I didn't believe she could do the job." He scowled at Wilma as she added, "I'd bet six month's wages she'll do a good job." "You may not have six month's wages if she messes up. I don't suffer fools and lazy people, as you well know. Right now, she looks like both to me," he growled. Penny let her eyelids shut completely at the hostile sound of his voice. A surge of adrenaline made her ears ring and her muscles twitch. Her anger churned, and her thoughts raced. Just who does this aging Adonis with a Neanderthal attitude think he is? Wilma thinks he hung the moon, and he acts like she is just some inconsequential employee when, in reality, she shields him from all kinds of thorny situations every day. She's always telling me about the mountain of work she does to smooth the way for him. What an insufferable man!